Merry Christmas! 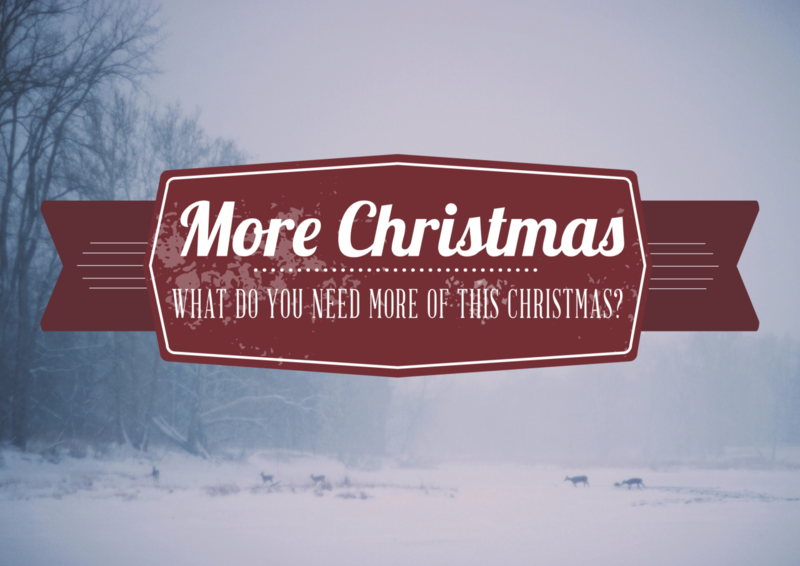 This Sunday we will conclude our Advent series “More Christmas” by saying we need more Jesus this Christmas. In John 15:5 Jesus says, “I am the vine; you are the branches. Whoever abides in me and I in him, he it is that bears much fruit, for apart from me you can do nothing.” The word “abide” is a great descriptor of how we live life fully in Jesus. To abide in Jesus means to be connected to Him. We connect with Him by accepting His grace, obeying His Word, and growing in His likeness. During a time meant to focus us on Christ, we are often more distracted from these things than ever. On the last Sunday of Advent, let’s join together in glorifying Him. I want to make sure you are aware of the church calendar over the next couple of weeks. December 24 (Christmas Eve)—We will have two virtually identical Christmas Eve services, one at 5pm and another at 11pm. The 5pm will include a special children’s message. Both services will be filled with singing, Scripture, and candlelight carols. Invite family members or friends who are not trusting in the good news of Jesus to be your guests. December 25-January 1—The church office will be closed. Please contact me directly if an immediate need arises. Sunday, December 27—Church at the usual time; 10:30am. No Education Hour. Sunday, January 3—Normal Sunday morning schedule resumes with the Education Hour at 9:15am and Church at 10:30am. Have a blessed Christmas as you celebrate the Savior! Adam has a passion for preaching God’s Word and seeing people come to know the joy of life with Jesus. Nothing excites Him more than pursuing the glory of God. He is originally from Minnesota, but received his Master of Divinity degree from Denver Seminary in Colorado. Adam enjoys reading, sports, movies, and spending time with his family. He and his wife, Holly, have two daughters.